Dealing with DM: Time to Heal | All Around Dogs Dealing with DM: Time to Heal | Thoughts on training and life with dogs. In January of 2016, a little over two months after Dash’s DM diagnosis, I broke my leg. The tibial plateau repair required a plate and seven screws but it changed more than the physical makeup of my leg. Once again, it feels like part of my life is mirrored by my relationship with Dash. When I first broke my leg, it was incredibly painful. Along with the physical pain came the emotional pain – that I was in for a long process, that I would miss opportunities to do things I loved, that my leg would never be the same no matter how well I cared for it. I knew from the day the metal plate went in that I would have it taken out. The end game was apparent from the very beginning. Suffer, adjust, grow stronger, then choose the date to be cut open and weakened once again. In December 2016, I had the plate and screws removed. Less than two weeks later, I said goodbye to Dash. I’ve begun the process of finding a new normal. Seeking to absorb what I’ve learned and being stronger for it. I suspect there will always be an ache now. It may come and go, flare and fade, but it will be there – part of an altered me. The break is gone, the bone has mended, but it is never the same. The loss of Dash is a phantom limb. Something no one else can see but that I can feel so keenly in my body. It’s an ache in my heart and a catch in my throat. And though I have moments of feeling weak from the loss, I know that his love has made me stronger. When the time came, I arranged with my vet to have Dash’s spine donated to DM research at the University of Missouri. 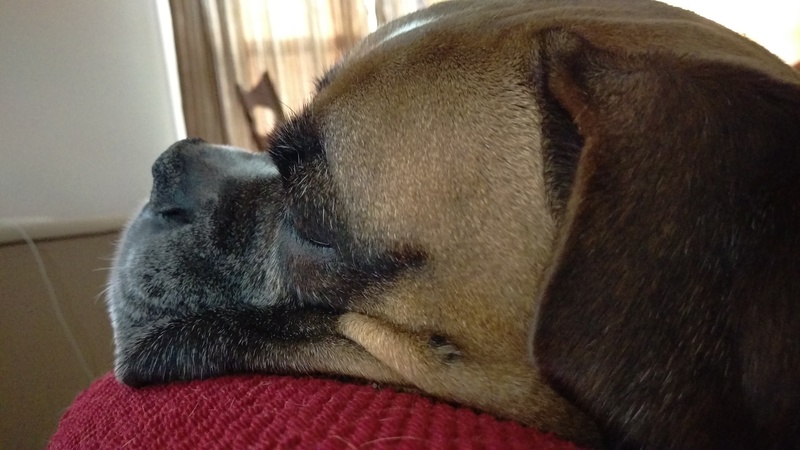 I’ve passed his rear end harness and his “no knuckle” PT sock to two Boxers going through this heartbreaking process. When I’m ready, his wheelchair will be passed along too. To anyone going through this struggle, I am so sorry you have to experience this. Treasure the time you have left. Do what makes you and your dog happy. If you live near Missouri or Massachusetts, consider participating in the clinical trials for gene therapy – a trial at Tufts was recently announced and I only wish it had been here a year ago. Gene therapy is showing promise for stopping the progression of the disease. And when the time has come, consider donating tissue to research and/or passing along your equipment to another deserving dog fighting this battle. Share the compassion that comes when you’ve been in that same place, engaged in the same battle that another person is now fighting.